Brooklyn Pizza Company and Sky Bar are the first two businesses in Southern Arizona to offset 100% of their electricity demand with solar energy. 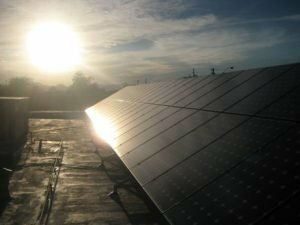 The decision is an example of the growing leadership of Arizona businesses that are using solar power to address the rising cost of energy and the impact of greenhouse gases on the environment. The solar installation, located on Tucson’s historic 4th Avenue, is comprised of 323 high-efficiency solar panels located on both the building’s rooftop as well as custom parking structures. The solar electric system will also serve as an electric vehicle charging station.The system is expected to generate over 160,000 kWh of electricity per year resulting in more than $488,000 in utility costs savings over the next 25 years. In addition to the environmental and economic benefits, this system serves to inform customers through an innovative educational display. Current energy production, green benefits, and fun eco-facts rotate on the wall- mounted monitor located in Brooklyn’s dining room. This is possible with the use of an online data monitoring system which provides historical power production and energy data. Solar electric (photovoltaic) systems benefit commercial operations in a multitude of ways. In addition to being a visible statement of a business’ commitment to being green, the outlay offers a typical return on investment of 15% or better. The financial picture is brighter for businesses compared to residences for several reasons: they typically pay more for electricity than residential customers, the state tax credit cap is higher at $25,000, and businesses can depreciate the cost of the system, leading to further savings. Financial incentives account for over 82% of the total system cost excluding depreciation. In addition, the solar system will provide 100% of electricity needs for Sky Bar and Brooklyn Pizza Company.